The conclusion to Between the Devil and The Deep Blue Sea, this gothic thriller romance with shades of Stephen King and Daphne du Maurier is a must-read for fans of Beautiful Creatures and Anna Dressed in Blood. Freddie once told me that the Devil created all the fear in the world. But then, the Devil once told me that it's easier to forgive someone for scaring you than for making you cry. The problem with River West Redding was that he'd done both to me. The crooked-smiling liar River West Redding, who drove into Violet's life one summer day and shook her world to pieces, is gone. Violet and Neely, River's other brother, are left to worry—until they catch a two a.m. radio program about strange events in a distant mountain town. They take off in search of River but are always a step behind, finding instead frenzied towns, witch hunts, and a wind-whipped island with the thrum of something strange and dangerous just under the surface. It isn't long before Violet begins to wonder if Neely, the one Redding brother she thought trustworthy, has been hiding a secret of his own . . .
April Genevieve Tucholke digs classic movies, redheaded villains, big kitchens, and discussing murder at the dinner table. She and her husband--a librarian, former rare-book dealer, and journalist--live in Oregon. 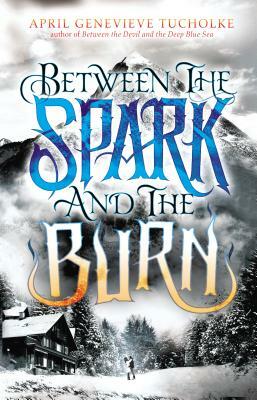 Between the Spark and the Burn is her second novel.